sanamjay has no other items for sale. Worked Great, Thank you ! Good Product !! Trusted seller! Horrible communication and was very unwilling to work with the problems I had. Setup was painless, was up and running within minutes. Has a strong WIFI signal throughout entire house and can even connect out in my barn. Pros: Dependable, no dropouts, strong WIFI. Cons: Bright status lights can be distracting in a darkened room. Unit purchased at an attractive price. It had been refurbished and upgraded. It was shipped in bubble-wrap with all necessary power and cabling components. Installation was easy. Problem surfaced initially with difficulties maintaining login information. At first, I simply thought it was my misapplication of changes. Repeated logins as I made changes did not appear to reflect problems. However, WiFi connectivity and WiFi performance appeared erratic. At times, Internet connectivity would disappear altogether. Connecting one of my PCs directly to modem became an imperative. The secondary PC remained connected via WiFi as it seemed impractical, due to distance, to wire it directly to the modem. Consequently, its effectvieness varied. WiFi misbehavior was also felt with Apple cell phones as well as an Ipad. Tried to login to modem to examine configurations and see if diagnostic or statistics might be revealing but was unable to access the unit using login and password I had established earlier and used successfully several times. Eventually, I wired the second PC and disabled WiFi on the phones and Ipad. Ethernet connected devices worked like a charm. Unfortunately, WiFi use is needed in my home so modem had to be scrubbed. The modem works great in terms of performance. However, the one I got, according to it’s manufacturer, is of old age and cannot perform up to it’s max download speed. Should go as far as 60Mbps, only went as far as 44Mbps. Results may possibly very for other people. This aside, it is a very great modem and definitely worth it’s value. I wanted to replace my Modem router and wanted exactly the same one the phone company uses and this one is exactly the make and model that I needed. Now I will not have a monthly fee since I will own the router. The product connected on the first try and operates exactly as needed. I do not have anything bad to say about the modem. 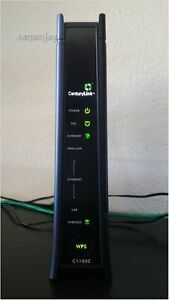 This router was in the top three recommended by Centurylink for 2017. Easy setup and has performed reliably. Perfectly working refurbished unit, a great value for money spent!